Next in our new series of interviews with some of Central Ohio’s finest jazz musicians is vocalist Rachel Sepulveda. Inspired by jazz, Latin, and pop styles, Sepulveda has been a leading jazz vocalist in Columbus for almost a decade. Her solo jazz project features a quintet of some of Columbus’ finest jazz musicians performing original arrangements and compositions, while also incorporating some covers. 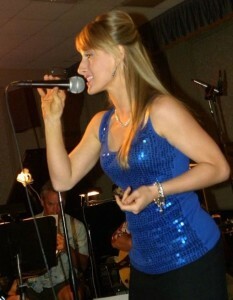 Her current projects also include fronting Top 40 cover band OKmaybe and providing vocals for many other performers and groups including The Bluewater Kings Band, Victor Zancudo, Vaughn Wiester’s Famous Jazz Orchestra, Big Daddy Blue, and The Sons of Gladys, among others. Rachel Sepulveda (RS): The music never stopped in my house growing up. My dad would play his sax along with Earth, Wind and Fire and Stevie [Wonder] recordings. My mom would blast music singing and dancing crazy around the house with me to Whitney and Madonna. My parents both had very eclectic tastes in music and loved to listen to everything from Motown to Phil Collins, Nat “King” Cole to Mozart, Carol King to Bernadette Peters. I was raised loving it all. Jazz really hit me when I started playing with my middle school big band in 6th grade. Not many people know, but trombone was my secondary instrument growing up and all through college until piano took over. I just fell in love with swing, the beautifully constructed melodies, and the denser harmonies. My ears were growing and I distinctly remember what an exciting time it was to hear sound in a way I never did before. Then I discovered Ella and Louis. I was always in classical voice lessons, but soon I began realizing the thrill and freedom of improvisation. I was like, “Wait a minute, you mean to tell me I can play around without always reading the notes on the page? !” I was sold… especially because I was at that rebellious, screw everyone else, I’m doing things my own way age. RS: Whoa, this is a heavy question… there’s a lot, so buckle up. When it comes to jazz singing and the American songbook, the beginning and the end for me is without a doubt Sarah Vaughan. I feel she had it all: Complete technical command over her instrument, ears that always heard the deeper harmony, but never lost touch with melody, the most sensitive and playful instinct to her musical surroundings, such tasteful judgement within her risk taking, and complete clarity and connectedness to the deeper meaning of her interpretation. She truly is the Divine One and I will love her forever. I’m also really influenced by the grit and honesty of Billie Holiday. She is another personal hero of mine. Listening and singing along with her for hours on end taught me how liberating and cathartic it is to be so vulnerable within singing. She also taught me the magic of leaning back on the time and back phrasing… giving people a good amount of time to absorb the meaningful message you put out, letting them read between the lines by leaving more space. Billie taught me to invite listeners into an intimate experience rather than just jam it down their throats. She draws her listeners in with her to experience the raw truths of humanity that are timeless through song. Just listen to her 1954 version of “I Thought About You.” She lays it all down in that recording. I remember driving down the road and had to pull over when I first heard that recording because I was sobbing my eyes out and couldn’t see the road right in from of me. There’s a big part of me that is still influenced by my classical voice background and I admire the simplistic beauty of vocalists who strive for technical perfection while being seemingly effortless in their approach. For these reasons I am endlessly enchanted with singers like Karen Carpenter, Jo Stafford, Nat King Cole, Julie London, Chet Baker, Bing Crosby. RS: I decided to stay in Columbus the summer of 2006 after finishing up classes at Capital for the school year. I loved to salsa dance and would go see this incredible band, Yumbambe, Tuesday nights at the old Columbus Music Hall. It was sometime around May and I remember dancing with some old sweaty guy I didn’t know who was making small talk and trying to put the moves on me when I heard this amazing piano solo. I looked across the dance floor over to the band and saw the pianist just goin’ crazy. I mean, the guy was totally gone in the music. His head was whippin’ around and he had a smile from ear to ear. I also happened to notice he was like OMG sooo freakin’ cute! I kinda knew in an instant that he was the guy for me. I found out his name was Tony Bonardi (and he had big muscles). So we got to talking on set break about Brazilian music and Jobim’s tune, “Samba Do Aviao.” We started dating after that and have been together ever since. We’ve been together 8 years and just got married this past summer. RS: Well, mostly the songs I have to learn to keep the gigs happening, but for enjoyment… I have a total girl crush on Esperanza Spalding. Brian Blade and the Fellowship have been knocking me out for a while too. RS: It’s all about the people and the players. This is not just a jazz scene. It’s a close­knit family with a vibrant energy and history. There is one particular individual I must mention because he played such a central role in my growth as a musician… Mark Flugge was and still is definitely my greatest inspiration on this scene. He was my teacher first, became my friend, and eventually also my colleague. I was pretty much a wreck when he passed, but I started noticing how very alive he still is through the music and the love of all he touched. That has been really healing. I’m so glad to know we can all still hear Mark’s playing when we listen to his friends like Vaughn Wiester and the Famous Jazz Orchestra, Aaron Scott and his Quartet with Dave DeWitt, Derek DiCenzo, and Randy Mather, in Stan Smith’s guitar playing, and Michael Cox on sax, Erik Augis and Lisa Clark-­Augis. We can hear Mark in the playing of all his adoring and inspired students: Tony Hagood, Chris Guthrie, Lucas Holmes, Danny Bauer, Kevin O’Neill, Aaron Quinn, and so many others. What inspires me most about this jazz scene is its heart. RS: I have a particularly exciting show coming up through City Music Columbus who will be featuring my group, Ritmo Ondas, in their 2014-­15 concert season! We’ll be playing at the Via Vecchia Winery on Valentine’s Day weekend, Sunday, February 15th at 2pm. The show is 2 hours and is unique in that the first half is all Latin music sung in Spanish, while the second half is all Brazilian sung in Portuguese. Please check out the website: http://citymusiccolumbus.org/rachel­sepulveda/. For more info on Rachel, visit www.rachelsepulveda.com.